The information about this bug in Launchpad is automatically pulled daily from the remote bug. This information was last pulled 36 minutes ago. 2) The version of the package you are using, via 'apt-cache policy packagename' or by checking in Synaptic. See attached screenshot. The text on the progress bar is extremely hard to read. Those colours are probably complementary colours that's why the text is very hard to read. I guess this bug is related to #37603. LP status change reflects an equivalent change on bugs.d.o. The according bug in Debian (https://bugs.debian.org/418361) has been closed in Debian as "not actionable". Please see the discussion there for details. Besides: In my terminal (uxterm), these colors are readable without issues while I agree that the colors in the screenshots are suboptimal. 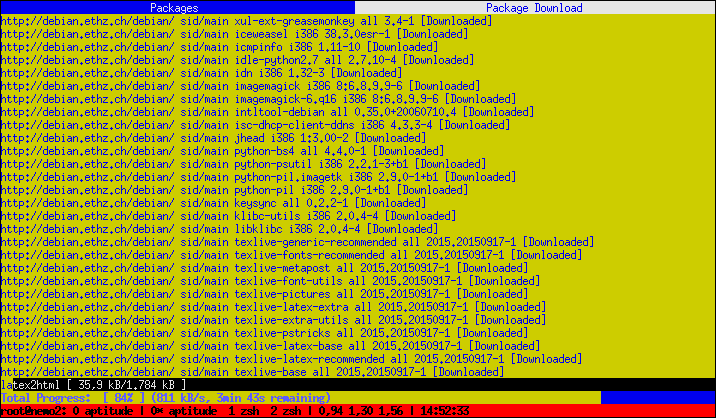 But the exact color of an ANSI color depends a lot on the terminal. I suspect the screenshots is from a libvte-based terminal. JFTR: I just checked, for me the background color in this widget is a light yellow, not an orange. Seems to make a difference wrt. to readability.